Outbound Invoice 810 EDI documents may be created without an originating Inbound PO 850 EDI documents. To do so, apply the configuration settings as described below. Set ALLOW_STANDALONE_810 to Y to enable Standalone 810 documents. To enable Standalone 810 documents, go to SPS Integration > SPS Integration Setup > Integration Configuration and select Connector Config from the drop-down. 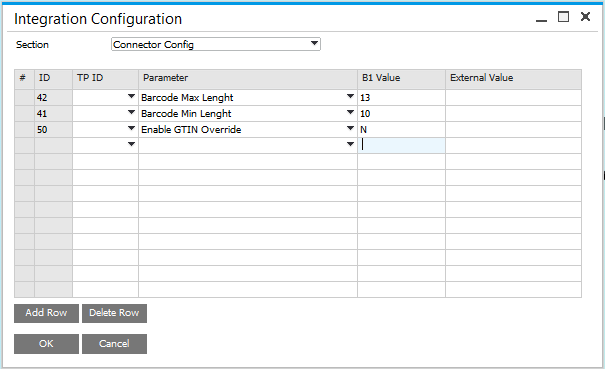 For the parameter ALLOW_STANDALONE_810, set both the B1 Value and External Value fields to Y. As part of the workflow service, oInvoices xml must be configured. To do this, ensure there is an oInvoices.xml file in the Workflow Service’s DefaultResultDocuments folder, which contains the following contents. Note that the default location for this file is: C:/Program Files (x86)/zedIT/zed WorkFlow/service/xml/DefaultResultDocuments/oInvoices.xml. By default, SAP Business One (B1) Invoice documents do not result in an Outbound Invoice 810 EDI document, even when all other settings are enabled. A flag must be set on the B1 Invoice document to ensure Outbound Invoice 810 EDI documents are only generated on an as-needed basis. To generate a standalone Outbound Invoice 810 EDI document, ensure the SAP Business One Invoice document has its SPS Order UDF set to “Yes”. Set the SPS Order field to Yes for SAP Business One Invoice documents that must generate a standalone Outbound Invoice 810 EDI document.